Fish Recipes NZ - easy fish recipes! Everyone knows that fish is good for you. But it seems that many people are afraid of cooking fish at home. We eat twice as much fish in restaurants as at home. Buying, storing, and cooking fish isn't difficult; it just requires a little knowledge. Whole fish should look as they were just pulled from the water; bright eyes and firm flesh are signs of freshness. Fish fillets or steaks should be firm and bright looking, with no brown spots or discoloration. To poach the fish, lay the fillets flat in a large frying pan. Pour the entire bottle of wine over the fillets and bring to a boil. Turn the fillets over at least once. When they begin to break apart easily (about 4 min), remove fish pieces from wine with a slotted spoon and set aside. In a separate frypan, cook the onions in olive oil over medium heat until soft. Add tomatoes, fresh parsley and cooked onions to wine. Boil vigorously for at least 10 min to boil off alcohol. Add fish pieces and heat through. Serve with a loaf of crusty french bread. Preheat oven to 200?C. Line pie dish with pastry. 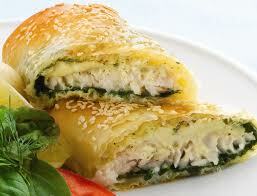 Place layers of camembert, surimi and spring onion over the pastry. Beat the eggs and milk together in a bowl and add the pepper. Pour the milk mixture over the layered fillings and bake in a preheated oven for 40-60 minutes until pastry is cooked and the filling is set. Pat fish fillets dry with paper towels so the crumbs will stick. Beat egg with 1 tablespoon of water in a shallow plate. Put crushed Weetbix or breadcrumbs in a shallow plate. Dip fish in egg, and then in cereal coating both sides. Bake 10 minutes at 230°C. Thicker fillets may need longer. Put the flour, eggs and breadcrumbs all in separate bowls. Start the process by dipping the prawn pieces into the flour, then the eggs and then the breadcrumbs. Arrange prawns on a baking tray and chill for 15 minutes. 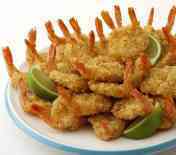 Heat enough oil in a large frying pan to shallow fry prawns in two batches for about 1-2 minutes or until golden, turning occasionally. Remove from oil and drain on a paper towel. Serve with tartare sauce and salad if desired. Place one fish fillet in the middle of a piece of tin foil or baking paper. Top fish fillet with some kumara slices, green peppers, carrots and leeks. Sprinkle with paprika. Wrap in tin foil. Repeat for each fish fillet. Bake in oven for 20 to 25 minutes at 180 degrees or until fish is cooked (fish is cooked when it is white all the way through). When ready, unwrap and enjoy.